#5. 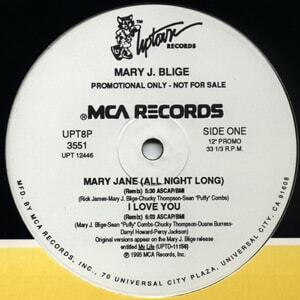 Mary J Blige f/ Smif-N-Wessun "I Love You (Remix)"
Smif & Wess hop on this banger from Mary's second album, My Life, and forcibly make it their own for this white-label favorite. One of the most eclipsing remix cameos in hip-hop history, "I Love You" stopped being Mary's song the moment Tek & Steele stepped into the booth. It's as if Chucky Thompson's refitting of Biz Markie's "Make The Music With Your Mouth" was birthed not for the Queen of Hip-Hop Soul but for the Boot Camp Generals.